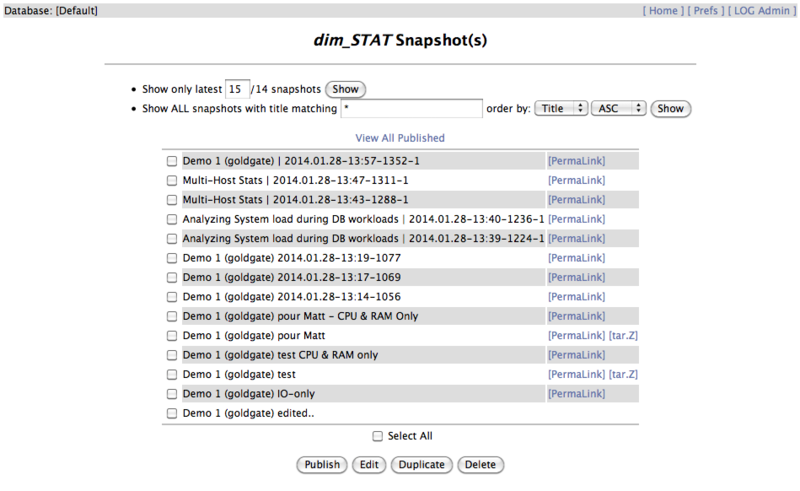 dim_STAT v.9.0-u14 Core Update is here! I'm happy to present you the latest CoreUpdate-14 for dim_STAT v.9.0 ! What are Snapshots? - in fact this feature was inspired by a more and more often need to save somewhere all or most of the graphs I'm seeing right now, while analyzing collecting data, rather generate them later when the work is done and observed issue was solved.. ReportTool is great for the post-analyze work, or for a straight forward reporting, etc. (you know exactly the time intervals you want to see, stats to graph, and so on) -- while during a live performance analyze you may have many intermediate graphs you're looking on which are part of the whole story board during your investigation, and they are all important as well as the base of your step-by-step logic and your final conclusion..
as soon as you click on [Snapshot] button a new Tab/Window will be opened within your web browser and containing all the graphs you're currently seeing + the 2 special fields: Title and Notes to allow you to add some annotations related to your graphs (as well you may select all the graphs or only a part of them)..
also, Snapshots data are partially saved within your database, so they are depending on it, and from one database you cannot access Snapshots of another one (except you're clicking on a [PremaLink], but this will just print you a static document, without any editing possibility)..
the Screenshots matching a Title pattern and ordered by Time or Title, Ascending or Descending..
link to [tar.Z] is pointing to a compressed TAR archive containing the whole Snapshot data (so can be sent as it and then deployed on any other computer as an HTML document)..
re-editing can be disabled for a given document if its directory contains a file with a name ".noedit"